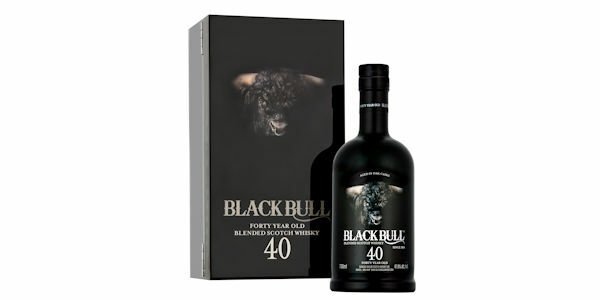 The eagerly awaited Black Bull 40 year old special release has been launched. Multi-award winning Duncan Taylor Scotch Whisky has added this new, exceptionally rare whisky to its distinguished range. Only 1,500 bottles of the limited edition, batch 7, Black Bull 40 year old will be available globally with a retail price of £750 per bottle. Loyal followers of Black Bull are expecting a whisky which packs a punch following the last batch that was produced in 2011. Whisky experts and enthusiasts poured huge praise on the last production of this blend, which received 94% rating in blind taste tests by industry leaders. The character of this latest batch has been captured in abundance, blending high quality single malts including Aberlour 1975, Macallan 1969 and Glenlivet 1968. With an ABV of 47.6% this is no ordinary Scotch Whisky. With a ratio of 86% malt to 14% grain it charts the journey of many a fine whisky from as far back as 1966. On the palate, the tasting notes for the new Black Bull 40 year old reveal a style that is rich, beautifully sweet and full bodied in character. Infused with toffee apples, milk chocolate, grapefruit and mango it gives a very smooth and gentle taste with a warm syrupy finish. A truly indulgent, perfectly balanced whisky, which is a gorgeous amber colour. Marking a new chapter in the unfolding story of Huntly based Duncan Taylor Scotch Whiskies. The company has ownership of one of the largest privately held collections of rare Scotch whisky casks. This latest whisky is undoubtedly a must-have for Black Bull enthusiasts.